Duncan Keith and the Chicago Blackhawks showed their playoff pedigree on the opening night of the 2015 Stanley Cup Playoffs. 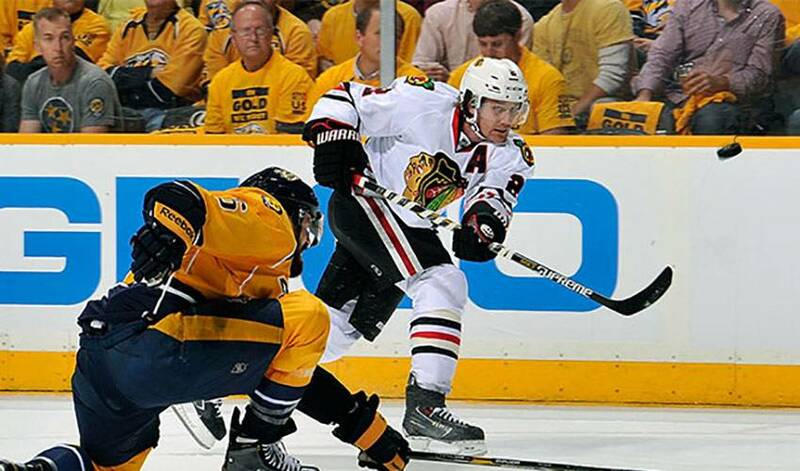 The Cup champs from 2010 & 2013 came all the way back to beat the Nashville Predators 4-3 in double overtime in Game 1 of their Western Conference Playoff series on Wednesday night. Down 3-0 to the Predators after the first period, the ‘Hawks answered back with three goals of their own in the second frame to square things up. After a scoreless third period, and first OT, it was Keith, in his 94th career playoff game, who played the role of hero, firing home the winner at 7:49 of the fifth period. STAT PACK: Keith, who has 56 career post-season points, had 55 shifts and 39:51 in ice time in the win. He also assisted on Jonathan Toews’ goal that evened the score. NEED TO KNOW: It was the third career playoff winner for Keith, who had six assists in 17 games in 2008-09, his first taste of NHL playoff action. A REAL PLUS: Keith has a lifetime +18 rating in the playoffs. TROPHY CASE: In 2005-06, Keith played in his NHL rookie season. Four years later, he won the James Norris Memorial Trophy as the top defenceman and won the Stanley Cup. He won the Cup again with the ‘Hawks in 2013. Keith also struck gold with Team Canada at the 2010 Winter Olympics in Vancouver and the 2014 Winter Olympics in Sochi. FAN FRIENDLY: The veteran blueliner made a young fan’s dream come true through his team’s #WhatsYourGoal initiative. Click here to see the video. THE SOCIAL SIDE: Check out Keith’s Twitter account (@DuncanKeith) and his official website (DuncanKeith.com) to learn more about one of the league’s top defenceman.